From the creators of the Hydrocollator Moist Heat HotPac, we are pleased to introduce Theratherm, a digital electric moist heating pad designed for the convenience of home use. The digital moist heating pad provides temporary relief from pain associated with muscle spasm and inflammation caused by strain and tension. 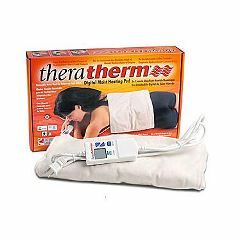 The Theratherm Digital Moist Heating Pad is easier to use than the other electric heating pads on the market due to its unique digital hand control. Most competitive units require continuous contact with a spring-loaded switch to generate and maintain heat from the pad. The digital controller allows one to set the temperature and time as well as features a lockout mode to guard against remiss touching to the controls during treatment. Specially designed 100% cotton flannel cover. Warning: The Digital Moist Heating Pad is not to be laid on or sat upon because the pads use a coiled wire system that will be crushed by the users body weight. The pad is to be used by laying it over the targeted body area. The premier heating pad available. The large size permits various uses - back, wrap around thigh, etc. The controls are perfect, offering a wider range of conditions and time than most people could possibly use. Absolutely the premier heating pad. Could use some additional sizes/configurations. This is my second - a friend didn't want to give up the one I loaned her. Provides perfect coverage. Safe. Lightweight. The neck/shoulder model works great for the neck and shoulders. Easy To Use. Heats Up Quickly. Even Heat. Safe. Lightweight. Sturdy. Easy Storage. Effective. Daily Use. Women. Everyday. exspensive. Easy To Use. Heats Up Quickly. Comfortable. Even Heat. Daily Use. Pinched Nerve. Sore Muscles. Muscle Spasms. The shape of the neck/shoulder model is ideal for getting heat to that specific area of the body (it is shaped to surround your neck and cover your shoulders). I have had a pinched nerve in my right shoulder and this product gets soothing relief to just the right area. The only negative is that when you unplug to move the pad, it loses the temperature/time settings that you entered and goes to a default setting. Great for sciatic pain, tennis elbow pain which I've used this for both and it works well. have TT Digital moist heat pad. How to get moist? I purchased the TheraTherm and love it but today I cannot set the temperaqture on the controller. What I get is the following: I can set the timer but cannot set the temperature. The screen reads blank where the temp should be and at the bottom of the screen E-30. Can you help? According to instructions, one should never lay down on a heating pad. I can't lay on my stomach either but I have been able to say on my side and lay it across my back with a pillow against it to help hold it on. how do i set the temp. I received mine from amazon with no paperwork! Does the heat pad can be use for the legs and thighs? also, it is ok for 220 and 240 volts? Does this digital moist heat pad have Velcro straps? No. It should. It doesn't stay on the back and you can't lay on top of it. You have to lay on your stomach and put it on your back. Awkward and not too effective. I will probably give it away, although attaching straps to it may halp. Does the heating pad come in 220-240 volts so that I can take it with me to South Korea to give to my daughter? Can it be used for the lower abdomen for period cramps? Thanks for the answer. Does the heating pad come in 220-240 volts so that I can take it with me to South Korea to give to my daughter? Can it be used for the lower abdomen for period cramps?